Apart from Linear motor drives, linear glass scales and ceramics etc Sodick wire EDMs are having advantages to support the following fascinating features which improves overall productivity. Additional features include Super Jet AWT, the new annealing type high speed automatic wire threading which takes approximately 10 seconds to thread the wire. The annealing AWT heats the wire about 300mm length to make the wire straight and stretches it to a sharp point when the wire is cut. This increases the reliability of the AWT because the wire is sharper, straighter & harder and can thread more easily through the lower guides. The annealing AWT also improves machining accuracy since smaller guide clearances can be used. In case of threading failure, Sodick machines have unique feature to rewind the wire back into the spool automatically without any manual intervention, and again it will rethread after cutting the wire tip and disposing the wire tip in the disposal unit provided. This saves time, wire and prevents manpower involvement. 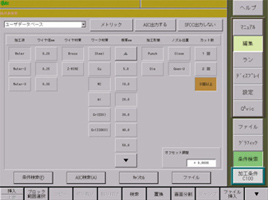 Heart NC Software, a database containing details on the best conditions for a particular wire diameter, workpiece material type and workpiece thickness helps to ensure the best possible machine performance is achieved, The operator can make use of the conditions Sodick provides and also add to the original database with his own know-how. By entering wire diameter, work-piece thickness and required surface roughness optimum machining conditions can be created automatically. During machining operation state of discharge is monitored in real time to maintain optimum machining condition. Improved machining performance in cutting stepped work-piece. stable machining performance enables long hours of unmanned operation and improved productivity. Without technical know-how, the high precision machining achieved by experienced engineers can now be easily achieved by anyone. In wire-EDMing of parts, the necessities of performing high precision machining on complex shapes with stepped height is increasing. The latest wire EDM machines from Sodick have adaptive power control technology which automatically adjust the machining parameters instantaneously according to the shape and varying thickness of the part. Latest “Discharging gap detection circuit” can precisely detect the status of the discharge gap during roughing and optimum servo control is possible even in finishing process. 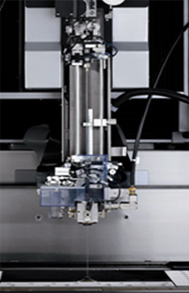 Wire tension servo function is standard to optimize the wire tension. This function monitors the state of the wire tension to adjust electric current of a servo motor in real time. This reduces the harmonic vibrations on the wire resulting in stable machining and high accuracy without any line marks. Taper Flex 45 is available as an option for further advanced high angle taper cutting up to 45°. Taper Flex 45 is easy to use and requires no special training. The function consists of three parts, high angle guides, and compensation jig and specialised software.